This recipe comes from my dear Aunt Bonnie who learned how to make frybread from her friend Beverly, (Goshute). I have fond memories of devouring her frybread. You can put a little honey and powdered sugar on them for a dessert frybread, or you can make delicious Indian tacos. Mix flour, salt, and baking powder. Add water gradually; mixing with your hands until very sticky. It will turn slimy like snot when it relaxes. Let sit for a couple of hours. Pour vegetable oil over top. DO NOT MIX. Cover hands in oil to keep the dough from sticking to your hands, then carefully stretch out a ball of dough to paper-thin. The thinner, the better. In a large fry pan, heat more oil or shortening until almost smoking. 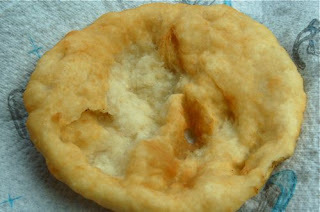 Cook stretched fry bread in VERY HOT oil, turning once. Transfer plate covered with paper towels to drain oils. Serve warm. **For those that get tough dough or crackers, you've kneaded or worked the dough too long or added too much flour. As for cooking frybread, I always try to use an old black cooking skillet. It keeps the oil or shortening temperature more consistent.